How things have changed for the Carol Burnett Show on DVD- as the format gained traction, many longed for at least some of it to be released on DVD but all that came early on was a short reunion special with a paltry number of clips and a similar disc after that. A few years after that though, mail-order outfit Guthy Renker started putting out DVDs (and VHS tapes) of complete shows, then Time-Life acquired the rights and put out a staggering number of releases from single discs to mega box sets. As that company tends to do, a number of the individual discs have been included in multiple sets, some with the same name which has gotten confusing. This six-DVD release commemorating the show's 50th anniversary has been issued at the same time as at least two other sets with the same title, one with eleven discs and another with 21. I wasn't even sure what I'd end up getting until it showed up. 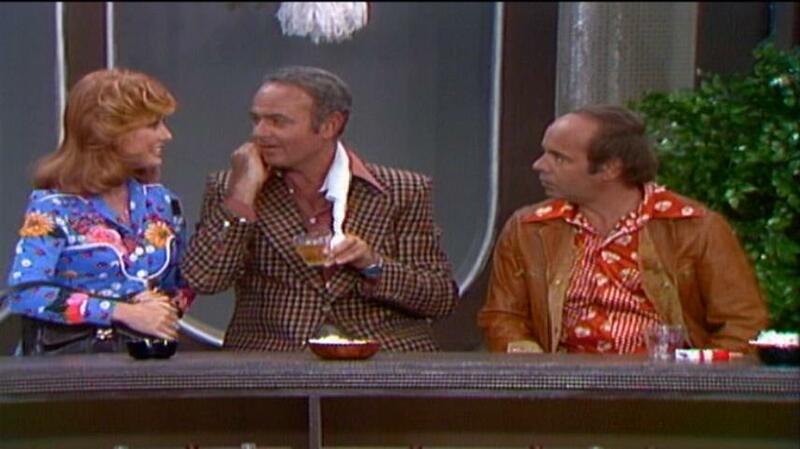 To shamelessly borrow from my review of the previous "Lost Episodes Collection," The Carol Burnett Show was a weekly showcase (running from 1967 to 1978) for Carol's versatile comedic talents and with series regulars Harvey Korman, Lyle Waggoner, Vicki Lawrence and countless guest stars. It played out much like a vaudeville show and most of the time followed a consistent structure- Carol herself would begin the show chatting with the audience which quickly became known as "Q&A" as she would get asked questions about the show (long before anyone in the world could send her email) and sometimes get put on the spot. 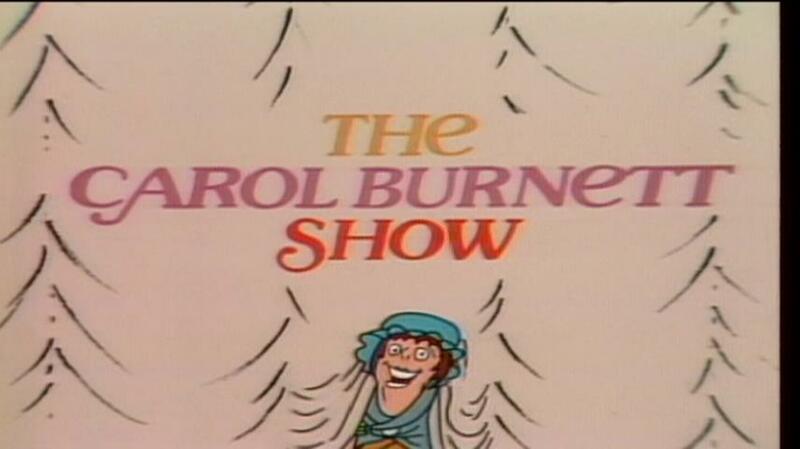 Following this would be comedy skits as Carol and company assumed an infinite number of characters, with one or two more serious musical performances from one of the week's guests in between and ending with a "Finale" sketch that would also often incorporate song and dance leading to Carol's "So Long" as the guests signed her autograph book. In the days with only three TV networks, while cable channels and VCRs were getting off the ground during the show's later years, it had a wide appeal and came close to being a live performance in viewers' living rooms. All of the new 50th Anniversary Editions span the show's entire run and all episodes were picked by Carol herself as her absolute favorites. One caveat however is that unlike the previous Time-Life releases, many of these shows have had segments cut due to the ever-present home video issue known as music licensing. Songs that might not have cost much to use in the show's original airing have tended to cost unreasonable amounts when the same shows get issued on DVD, so that holds up some releases and in this case the segments in question have simply been cut out. The "Finale" segments have been hit the hardest, with just a few of the shows here having them intact. This gets especially frustrating as the final "goodnight" in each episode is done on the same stage as the finale, so the shows end up closing with backgrounds and costumes from a part we didn't get to see. 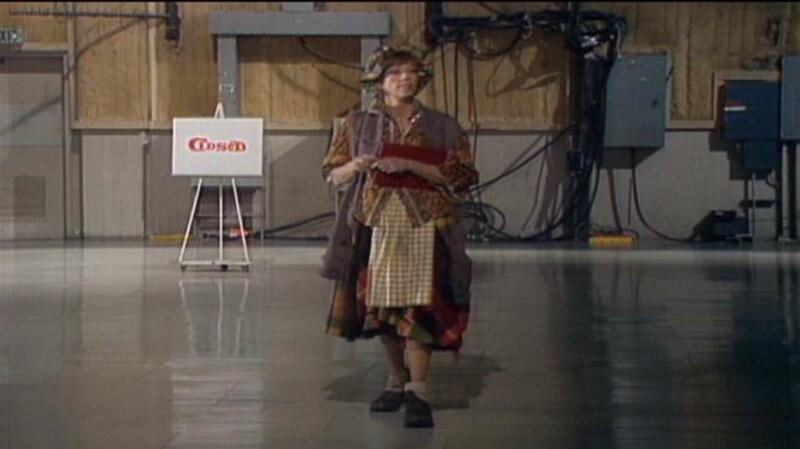 Other sketches and concepts that took off well and came up frequently were "The Family" with Vicki Lawrence playing Carol's elderly mother, a character who later got her own series "Mama's Family" in the 1980s, and "The Old Folks" with Carol and Harvey Korman on the back porch wondering where the time went. Parodies of old movies, which at the time were often seen on late-night and afternoon TV, are also done here often at great length. Other times the finale segments included here "salute" vintage cinema in music and dance form, including the song "Without a Word, Without a Sound" that recreates silent comedies. There's one finale that appears to salute classic monster movies judging from the Frankenstein-like figures seen in the background of one "Goodnight", but unfortunately that segment itself was cut. Musical segments that survived the cuts include Bobbie Gentry lip-synching "Sweet Peony" amongst a crew of go-go dancers, resident talent Lyle Waggoner doing "By the Time I Get to Phoenix" and Vicki Lawrence lip-synching her signature hit "Night the Lights Went Out In Georgia" in a 1973 episode and a later hit "Hollywood Seven" in 1976. One of the best shows in the set features the Jackson Five, who perform "Dancing Machine" with some pretty cool video effects and are also included in a sketch where Carol plays a music teacher- the interesting part of that one, explained in a recently-shot intro that precedes the show, is that an earthquake hit during shooting and while you can clearly see it happen they continued through it unfazed except for Carol briefly commenting "the earth just moved." 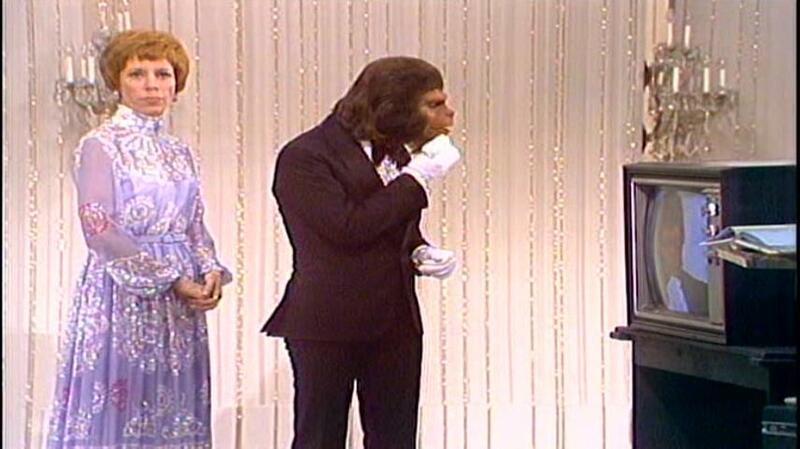 Roddy McDowall also appears in full Planet of the Apes makeup but plays it completely straight, doing a duet with Carol. Unfortunately this episode ended up on disc at 24 frames per second rather than the proper 30, making the picture quite jittery for the show's duration. Another memorable episode was shot during a musicians' strike, so in support of that all music used in that episode including the opening and closing theme is hummed. Surprisingly, this set does not include the famous "Went With the Wind" sketch which I'm pretty sure I saw during its original airing, though I wasn't nearly old enough to appreciate it. One would think that would have been a requirement- I even scanned through the set after watching all of it to make sure I hadn't missed it somehow, but all we see of it is a few seconds in one of the bonus features amongst other clips. 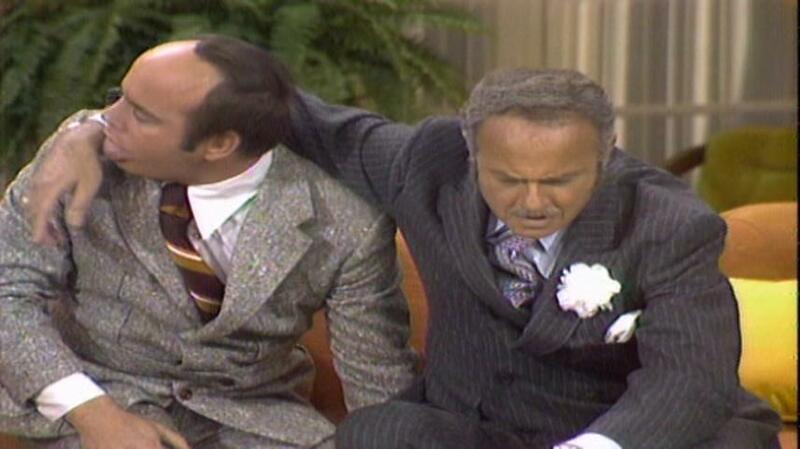 The 1978 final episode which aired in a two-hour slot is included and seems to be unedited except for the commercials (following this that night was part of CBS's week-long 50th anniversary celebration, which I managed to track down an off-air recording of) and retains the iconic 70s "CBS Special Presentation" opening with Morton Stevens music. It's a rather emotional affair that splits its time with showing favorite clips from the past (from tape masters that didn't look too good at the time) along with some final new skits that wrap things up- such as "Mama" and daughter Eunice finally visiting a psychiatrist and a surprise appearance from Jimmy Stewart which Carol didn't know about prior. She ends the show very candidly stating that the show's ratings had been fine, the network had picked the show up for the next year but she decided "it's classier to leave before you're asked to." Although Time-Life once again precedes each disc with an unskippable notice about the "film elements" used, everything here is from videotape and for the most part looks as good as the day it was shot (a quality I've always liked about video), with the one exception being the 1974 episode that was somehow encoded at a jittery 24 frames per second (the included recent intro to that show features similar issues, implying that something was simply set wrong when that episode was encoded. 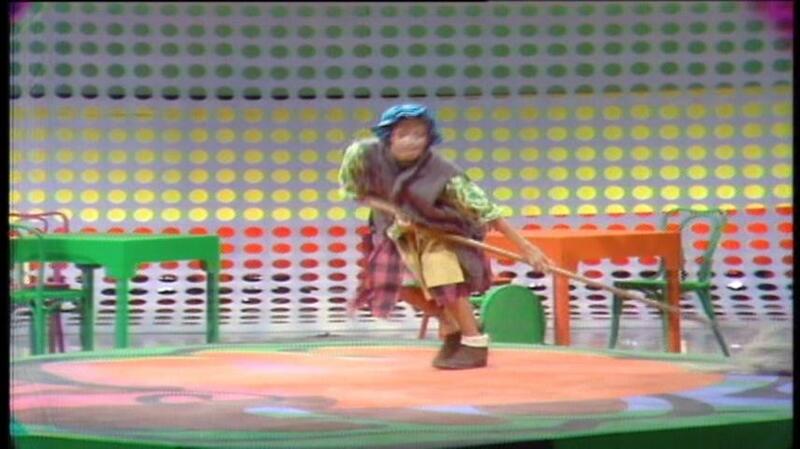 I've never seen professional DVD authoring first-hand so I don't know exactly what happened there.) The condition of the tape masters does vary however, with the shows from 1971 in particular showing intermittent horizontal lines, consistent with the previous Carol Burnett sets I've seen. Unfortunately another consistency is the sub-par encoding that Time Life has been using, resulting in noticeable compression artifacts at times. TV sound was of course mono when these shows aired, and the 2-channel Dolby Digital tracks keep it properly centered with sound quality likely better than most people heard when they originally aired- having anything resembling a real speaker producing TV sound was quite unusual then. While the sound is very clean, several shows do exhibit a bit of "print-through" which causes loud sounds to be heard faintly in the background a few second before they actually occur, spoiling a few gags where someone suddenly yells. Standard closed captions (which weren't used until 1980) have been done for these discs. Perhaps in an effort to take some of the pain off of the edits, a few episodes are followed with outtakes. A featurette titled "11 Years of Laughter" was done for this set and includes Carol expressing her thankfulness for having her favorite episodes together in one collection, along with reminiscing from Tim Conway, Vicki Lawrence and frequent guests Bernadette Peters and Steve Lawrence. An interview with androgynous guest Jim Bailey, shot shortly before he died in 2015, has him recanting how he got into impersonating female celebrities. "The End of 11 Years: Saying So Long" has more reminiscing and Carol reiterating that she felt it was better for the show to go out on top than overstay its welcome. A longer presentation of Carol's speaking on camera for this segment with fewer edits is also included. The six discs are packed in a standard-sized keepcase with numerous flaps inside, and frustratingly there is no printed insert as previous sets have had. (If you spring for the larger set, it does include a huge book however.) Even the disc labels only indicate the episodes by their cryptic "episode numbers", making it nearly impossible to locate favorite sketches without loading up the discs and going to the chapter menus, which thankfully are still included. One can never have too much Carol Burnett Show in their collection, and it's great to see these keep coming out but having so many edits in this set is quite a let-down. While it's still better than nothing, one can't help but wonder what we weren't privy to see this time around. I know there's at least a few shows floating around out there complete with the original commercials, as some of the early 70s commercials I've seen on YouTube were said to be taken from them- ideally I'd like to see those released to the public someday but that may be a pipe dream.